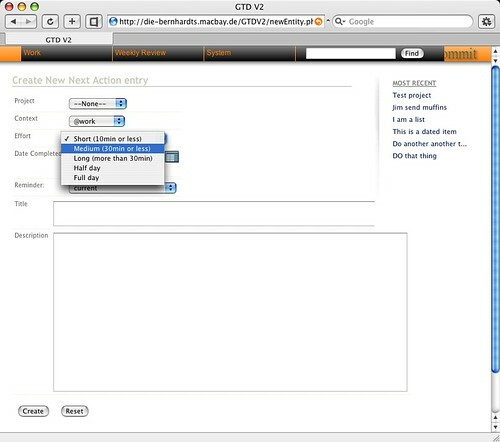 Rainer Bernhardt has put together a nifty little PHP app for doing GTD via a web interface. 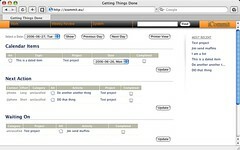 It lets you wrangle projects, next actions, calendar items, ad hoc lists, and all the other tactical building blocks of GTD all via your (non-IE) browser. The interface is pretty good and typical workflow is quite easy to navigate through. It has nice touches like attachments, per-item effort estimates, printable views, plus Rainer says he may soon offer email integration which would "eliminate use of a separate e-mail app" for workflow-related planning. Wow. Although I haven't spent a great deal of time with it, I'm very intrigued by the baked-in "weekly review" functionality, which walks you through most of what you need to look over each week from one interface. 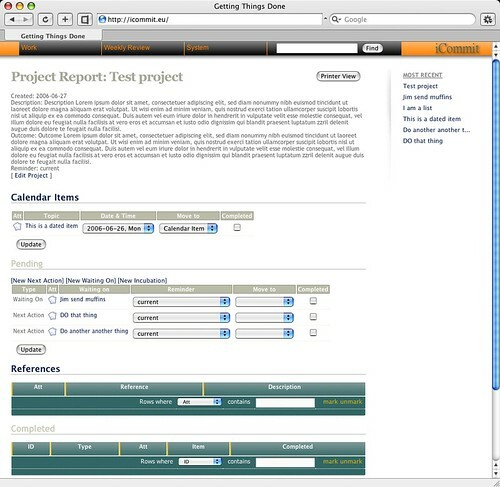 Since review gets short shrift from the many folks (like me) who use GTD primarily for task management, I think an addition like this is a terrific idea. iCommit is, like so many of my favorite apps these days, a non-commercial, one-man operation, so there are a few rough edges, no documentation (yet! coming soon, says Rainer), and it is very much "first come, first served" in terms of seats he can handle on his personal server setup (I hope we don't cream Rainer's productivity boxen with this). 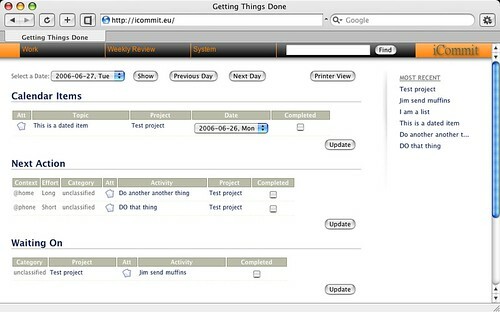 But iCommit is worth a look if you've been craving a cross-platform, low-paper implementation of Getting Things Done. Screengrabs below the cut -- I feel like Michael Arrington! Logged-in with a few test items. Submitted by Merlin on June 27, 2006 - 5:59am. I actually agree with you, Chris (in terms of my own usage), But you wouldn't believe how many cross-platformers -- esp. Mac lovers with Windows dayjobs -- are clamoring for something like this.